Lynne & Augie Nieto, Founder of Augie’s Quest, and Pat Monahan, honorary chairperson and lead vocalist of Grammy-winning band, Train. 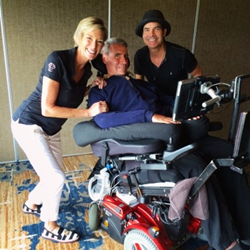 On Monday, August 8, the TPC at Snoqualmie Ridge in Sammamish, WA will host the 6th Annual “Calling All Angels” Golf Classic to support Augie’s Quest and the ALS Therapy Development Institute in its efforts to find a cure for ALS. Last year’s event raised over $111,000 for ALS research. Also known as Lou Gehrig’s disease, ALS is a progressive neurodegenerative disease that leads to the paralysis, and eventual death of those afflicted. At this moment, there are approximately 30,000 people in the US living with ALS, and the average patient survives only two to five years following his or her diagnosis. The “Calling All Angels” Golf Classic will feature lunch, putting contest, and golf tournament (four person scramble format) on August 8th. Pat Monahan, lead vocalist of the multi-platinum band, Train, will also be in attendance as the event’s honorary chairman! Sponsors of the “Calling All Angels” Golf Classic also include the Land Advisors Organization, ProBuild, Shea Homes, Triple Horn Brewing Company, Choose Your Playbook, LLC., Plats Financial Group, Polygon Homes and First American Title Insurance Company. All proceeds from the “Calling All Angels” Golf Classic benefit Augie’s Quest, an aggressive, cure driven effort focused on finding treatments and cures for ALS by supporting the research taking place at the ALS Therapy Development Institute. The “Calling All Angels” Golf Classic will be held on Monday, August 8th, at the TPC at Snoqualmie Ridge in Sammamish, WA. Registration opens at 1:00PM with a shotgun start at 1:45PM. For more information about this event and to register, please visit our website http://www.classy.org/CAA2016 or check us out on Facebook at https://www.facebook.com/SeattleALSGolf. Augie’s Quest is an aggressive, cure driven effort focused on finding treatments and cures for ALS. Since 2007, Augie’s Quest has raised more than $48 million to fund ALS research – making it the largest individual fundraising program for ALS! Augie’s Quest supports the ALS Therapy Development Institute, the world’s first and largest nonprofit biotech focused 100 percent on ALS research. Support comes from a huge network of national events and promotions, including the BASH for Augie’s Quest, Tradition of Hope Gala and widely successful campaigns within the very generous fitness industry, such as the Clubs for the Quest, as well as a hugely innovative joint-fundraising initiative called the ClubCorp Charity Classic which benefits Augie's Quest and other local charities chosen by that networks members directly. For more information, visit http://www.augiesquest.org. The ALS Therapy Development Institute and its scientists actively discover and develop treatments for ALS. We are the world's first and largest nonprofit biotech focused 100 percent on ALS research. Led by people living with ALS and their families, we understand the urgent need to slow and stop this disease. For more information, visit http://www.als.net.